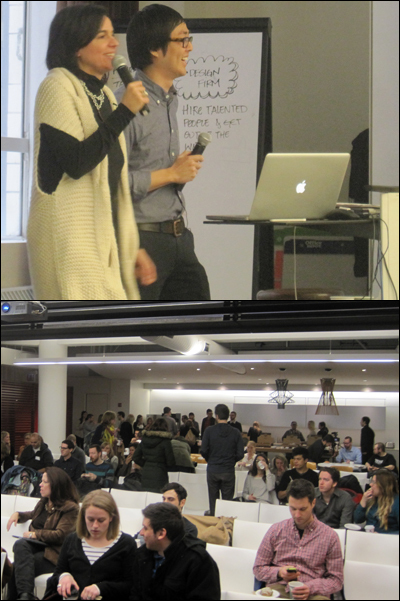 This year’s 2nd Chicago CreativeMornings (and the 15th one in that city) kicked off with Jeremiah Chiu and Renata Graw (above top), founders of the Chicago-based creative studio Plural Design, held at the Chicago location of international architectural firm Gensler. They shared their fondness for being weird, along with their pursuit of meaningful projects, not money—CreativeMorning’s theme for February 2013. It’s been advised countless times to never start anything only for the money. Graphic Designer Scott Reinhard, who spoke at the 13th Chicago CreativeMornings, emphasized his priority to “really learn the content you’re working with.” Graphic Designer and Illustrator Mike McQuade, who spoke at the 9th Chicago CreativeMornings, emphasized the intensive process of taking an editorial illustration from start to delivery. 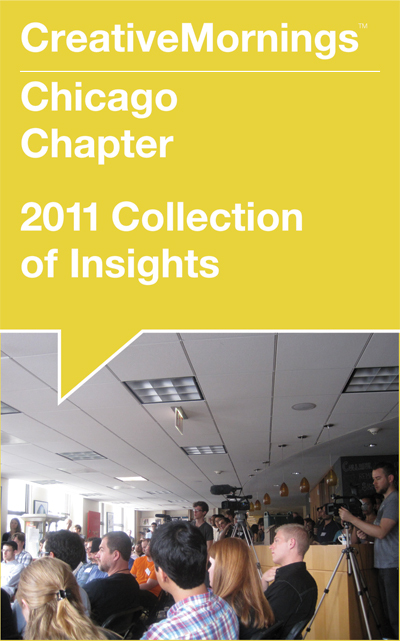 All the presenters at Chicago CreativeMornings persistently practice the belief that intangible rewards outweigh what’s easily judged as the most important thing (i.e., money). “I work from home in a small house in Reigate, Surrey. In fact, everything I do is pretty small. I like to keep my business small because I want to keep the quality high and the communication tight. I work mostly with small businesses, startups and individuals because I value close working relationships and informal processes. “Weird” here essentially means taking risks, which creativity demands. It’s about harnessing imagination with what feels uncomfortable, even counterintuitive. Never easy. Timely that the 15th Chicago CreativeMornings coincided with the birthday of Edward Gorey, an illustrator who sought the peculiar as a direct influence in his work: “My mission in life is to make everybody as uneasy as possible. I think we should all be as uneasy as possible, because that’s what the world is like.” Weirdness can be a source of fascination to help feed how work is imagined and expressed. Meaning, not money. Embrace small. And keep it weird. Big thanks to: Gensler for sponsoring and hosting Chicago CreativeMornings #15; to organizers Kim Eertmoed and Kyle Knoll of Knoed Creative (who spoke at Chicago CreativeMornings #7), videographers Chris Gallevo and Erick De La Rosa, Isaac Stein for greeting, and the rest of the Chicago CreativeMornings crew for their great work on making CreativeMornings happen in Chicago.